In 2017, Gucci became the first fashion company to reveal their latest, spring/summer collection at Westminster Abbey in the United Kingdom. The fashion ran is extraordinary for other fashion houses, but for Gucci, who have been doing different and amazing things through the history, this is just another chapter in their massive book. 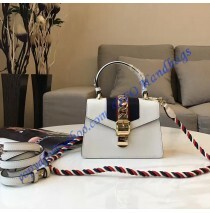 It is believed that Gucci sells passionate products to individuals who are looking something which is completely different. As such, we must advise you to pay a close attention to the latest, Sylvie Green Leather Mini Bag. Right now, it is one of a kind. In the near future, it will still stay one of a kind bag! The bag begins showing off with the buckle and chain, designed to look like they are made from actual gold. The handle shares the same path and combined, they make this mini-bag desirable. An interesting addition regarding the buckle is the fact it was ‘’borrowed’’ from the archives of the company. For you who prefer having something classical, the bag is a right choice. 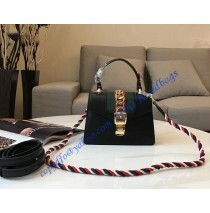 In addition, the classical buckle is well-mixed with the Web stripe and rest of the design. 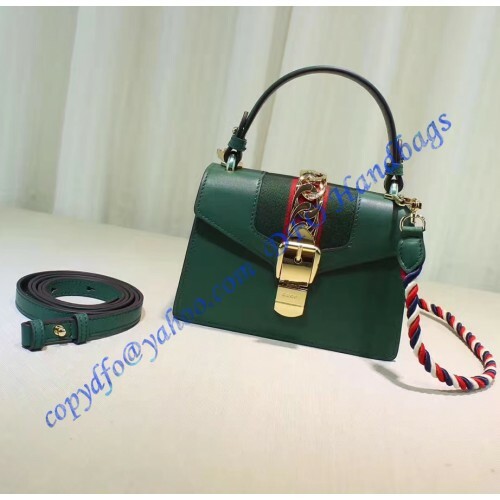 Main features of the bag include green leather, firm and resistant to minor damages. 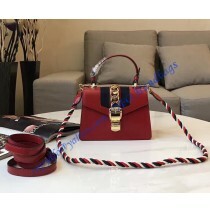 Red and green nylon Web must be mentioned as well, so as metal chain and buckle which are decorated to perfection. A shoulder chain is detachable, but a far more interesting matter is the hook system it features. It is designed to stay easy to use and strong at the same time. Another shoulder strap is made from leather and designed to be an additional fashion statement. And yes, it is also made from the same leather as the bag is. The interior pocket is sufficient for most items, despite the fact this is a small bag.